The next 5 mile handicap event will be on Wednesday 13th December - meet at Cranford Community College opposite Crane Lodge Road. The course has been quite carefully measured with a surveyor's wheel and is much more like a real 5 miles than the (shorter) one used in previous years. Changing rooms and showers will be available at Cranford Community College which is served by buses and has a large free car park. Handicaps will be applied so that the first (slower) runners will set off around 18:00 but we should all finish at about the same time at about 19:00. After the run we'll retire to the nearby Queen's Head which gives a 15% discount on food and drink on production of a current BA Clubs card (the turquoise card). The scoring system this winter will reward consistency and improvement and the best four of six runs will be taken account of in the final analysis. As we are using new courses, watches and distance measuring devices will be allowed for anyone's first run - thereafter reference within the run to whatever you depend on is against the spirit of the completion. The final GP event of the season took place at Uxbridge at the end of October. Once again, we threatened world record times, but the cool temperatures meant we had to settle for strong finishes, followed by fifteen laps of honour in front of the sizeable crowd of floodlights. Simon again took the honours, while Tony registered an impressive finish after a problem with the electronic timing. We continued with a 25 x 200m relay, or at least that’s what the baton did. Each of us ran eight or nine 200m legs, waited for the baton to reappear, and set off again. The baton completed the 5K in 20:32. If you fancy trying some winter track training, let me know. Ed: There is no truth in the rumour that Tony hasn't been able to run since this event...or perhaps it is true? Anyway he is getting physio for his problematic piriformis and hopes to be back in circulation in a couple of weeks (though whether and when that will involve circulation of the track, we shall have to wait and see). There were a total of 21 runners from four airlines; Iceland Air, SAS, Aer Lingus and BA; with 8 ladies covering the 3 lap "3 miles, 5k" course and 13 men covering the 5 lap "5 miles, 8.33k" course. I've written the distances in quotes because for the "5 miles" my Garmin recorded 5.91 miles and it normally slightly under records. Iceland Air had the largest team and comfortably won both the men's and ladies events. SAS came second in the men's and third in the ladies with Aer Lingus third in the men's and Lufthansa second in the ladies. Tim and I finished and nearly achieved a third place team finish in the men's event - we were one point behind Aer Lingus which means that if a third runner had been with the team, even if they had finished last, we would have won or at worst shared third - so where were you? Individually Tim finished 5th out of 13 in 45:57, I finished 11th in 58:35 - not bad considering our earlier 5k and that the distance was longer than we had planned for. There were more than 21 attendees at the event - Paul Beck was a non-participating team captain for Lufthansa, Ralph Behrens (who had run Father Collins with us) took photographs (once he'd taken someone else's camera). Aer Lingus had several non-running team members setting up and running the event and we managed to bump into Dave O'Connor (Dublin WARR chairman) in the ALSAA building just in time for lunch and drinks. As for the trip - well I managed to keep my Guinness count to single figures but I'm not sure how many of the others did also - we were well looked after. This was last year's ASCA cross country. There was talk that this year's may be hosted by SAS in Copenhagen in April. Whilst I don't expect to be there myself (after all, I don't do cross country) I can recommend some good parkruns in Copenhagen. We have had exceptional interest in places for the 2018 London Marathon. If you haven't asked for a place yet, and still want one, please contact me before the end of November. During the next week I will be checking with all applicants, to see whether they are still looking for a place, so that we know how many names we will be putting into the hat next month. If you would like to help marshal the London Marathon 2018, please let Simon Turton and I know in early January. Hot on the heels of the last match comes the 3rd fixture of this season at 3pm on the 2nd December (our first December race since 2010, I think). Details should get posted at: https://surreyleague.org/slm/match/90/ but aren’t there yet. Another member earned a black vest this week as Alice Banks (26:42) completed her century of parkruns at her home course at Maidenhead. She has also volunteered there on multiple occasions. Club treasurer Chris Kelly (21:08) also ran and achieved a course pb but the course record remains with the safe legs of Barry Walters (20:55) for another week. Benita (31:08) and John Scaife(31:10) were also running to help Alice celebrate. They have now both run at Maidenhead 50 times. Tim Bellars (21:33) and Roderick Hoffman (27:04) were in Dublin for the ASCA cross country and warmed up at the parkrun in Father Collins park in the Sandymount district of the city. The park was opened in 2009 and is notable for being 100% sustainable, featuring its own wind turbines. Tim finished in 11th place - with one "Chris Kelly" in 4th place in 20:02. But obviously not our one Chris "Christopher T" Kelly. Dave Dixon (17:24, 86.88%) was far and away our fastest runner this weekend (at Hackney Marshes) and exactly matched his previous time and best age grade score achieved the previous time he'd run 3 week's earlier. Julie Barclay improved her pb at Woking to 21:09 and beat Paul Watt (21:52). Not only that, Paul’s pb at Woking is 21:10 so the next time they go there it could be really interesting. No doubt Tom Rowley will keep us posted. They were at Woking to see Mike Cussans (31:04) a former colleague complete his 50th run. Ian Cockram volunteered as tailwalker at Bedfont Lakes to chalk up his 250th “run” there. And on the subject of Bedfont Lakes parkrun this coming week we all are invited to join in at Bedfont Lakes parkrun where we usually have good representation anyway. It is a pacing week and in all probability any puddles will be shallow. For those travelling by car the Bedfont Road carpark is recommended over the Clockhouse Lane one which may be nearer the start but is much smaller and fills up quite early. Please try to get to the start with plenty of time for us to take a club team photo. Steve Newell took a week off and travelled to Cyprus where parkrun has yet to get started. The trip coincided with the 50th anniversary of his first flight on staff travel. While November is usually a good month for stress free flying the demise of Monarch Airlines is thought to have changed matters on some routes. Anyway, Steve travelled back from Paphos in the galley jumpseat in the tail of an A320. Life is never dull. Two new parkruns started up in Bristol last Saturday. Since the demise of Little Stoke there have been just three parkruns near the city but Thornbury and Eastville both had their inaugurals. Having the two inaugurals on the same day probably helped keep numbers down but at Thornbury there were 337 runners and at Eastville a UK record 679. The Eastville participants included the Sinton-Hewetts who we know would have turned into volunteers had they thought there were too many participants. Eastville coped - despite having only 448 finish tokens, watches that could only record 500 times and a finish funnel that wasn't long enough for the peak finish period. I've done some analysis of the attendees and up to 80 of those attending could be classified as "Little Stoke regulars" even though Little Stoke closed 18 months ago - i.e. they are parkrunners who haven't settled at another parkrun since (some have become seasoned tourists). If any of you want to get a good finish position then the "go to" parkrun is currently Moberley in the States (in Missouri, between Kansas City and St. Louis). There was one finisher on Saturday - in a time of 44:32. The pictures reveal a lovely park though apparently it was raining. But don't give up on parkrun in the US just yet. Moberley was one of fifteen US parkruns run over the weekend with a total participation of 647 (plus volunteers) including the brand new parkrun at Renton near Seattle which attracted 81 participants including Brian and Gaylene Donner of Alaskan Airlines, doing their second parkruns following their first ones with the BA WARR team at Root 44 back in 2013. With Ralph now parkrunning, Dave Gall doing his local in New Zealand and several of the Qantas team regularly parkrunning the message is spreading. And finally for this bit for this week - Ben Robinson finished his parkrun at Kingsbury Water in a time of 12:24...sorry, I'll say that again, twelve minutes and twenty four seconds, so thirteen seconds faster than the world record for 5,000 metres on the track. No, he didn't find a short cut (across the lake!) but he was assisted by his dog. The dog clearly made a difference - Ben's PB is 14:59 - but his legs have still got to travel faster than those of Kenenisa Bekele who holds the 5,000 metre record. Ben discovered an interesting fault in the parkrun computer - the parkrun computer currently doesn't believe a time faster than 13 minutes is possible at a parkrun hence "13:00" is currently recorded for his canine assisted performance. New York City Marathon. November 5, 2017. An unexpectedly warm weekend last week for the 47th NYC Marathon encouraged some pleasant strolls around mid-town Manhattan. From the Expo, along the High Line, from the Death Ave Brewery Co to Madison Square Gardens to see the NY Knicks (with their 7'3" Unicorn, Kristaps Porzingis) beat the Phoenix Suns. A substantial pre-race-day breakfast at the Brooklyn Diner, was followed by some carbo-loading in Little Italy, via a Staten Island recce on the Ferry and the moving 9/11 Memorial. Thanks to the UK-US time difference the 4.30am start to get the 5.30am coach from the New York City Public Library wasn't too bad, and the cool wait at Fort Wadsworth was mitigated by some fine coffee and toasty little fleecy hats from Dunkin Donuts. I chatted to a similarly named Kenyan chap based in Florida for the last 20 years who used to do mainly XC and is now doing a few Marathons. He allayed my concerns about my lack of running since our last XC at Wimbledon, where I pulled my calf, and suggested that I could imagine that I had merely embarked on an elongated taper and I might even feel the benefit halfway round. It was a nice idea, not totally borne out by events. But I saw that he finished in 2:38 - still wearing the Donuts hat - so he obviously knew what he was doing. At the Expo, the coaches offered sound advice about not going out too fast, and tried to encourage Bill Rodgers to brag about his four NYC and Boston victories - but he was far too nice - instead extolling the virtues of worthy adversaries he had lost to! 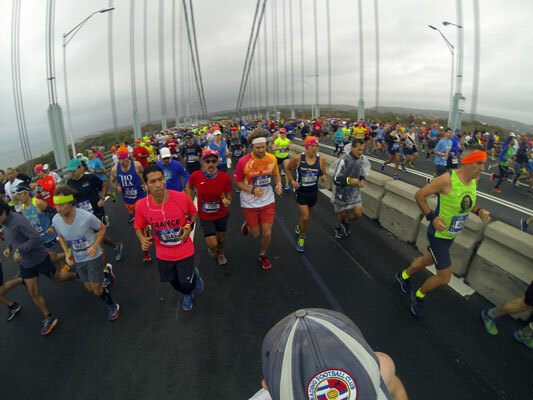 In fact, the start - across the photogenic Verrazano-Narrows Bridge was very relaxed, in spite of Frank's crooning - with many of us loosening up, and taking snaps - so there was no problem warming up and no problem with space. Remarkable considering the huge field, but I guess the wave starts and awesome logistics were well justified. As we got over the bridge, we were able to speed up a little on the far side, and then a little more on the long flat section through Brooklyn. It's not an ideal course for people who don't like to know where they are going, as there were a few quite long stretches which seemed to go on and on, but then Marathons do go on for a while, so no real surprise there. I remember turning at Lafayette Ave - 8 miles - and then it did get more windy. As we crossed the Pulaski Bridge into Queens at about halfway, I attempted an enthusiastic "Good Morning Queens!" but it didn't sound quite right. The day was now turning out rather misty, and so I did miss the side-on views of Manhattan I'd been looking forward to, but on the upside, the temperature was a highly acceptable 12degrees which was good for the running. As we crossed the Queensboro bridge into Manhattan, and curled round underneath onto First Ave at about 16miles, the crowd noise picked up, and with it, I picked up my pace, at least for a while (still ten miles to go...). By 20 miles, we reached the Bronx, and there were quite a few bands playing, to support the Boogie Bronx image we were promised, and as we turned back towards Harlem, over what one sign described as "The Last Freaking Bridge" I was looking forward to getting finished, but, as I had been advised, there is still some ascent required to get down Fifth Ave and into Central Park from 22 to 24 miles. Those miles did go quite slowly. Eventually, we were into the Park and looking for the home straight. There were still a few more curves, and corners before it came. I stopped at Grand Army Plaza to try to find my wife Sarah, and even got the crowd chanting her name, as it was pretty jammed, but it turned out she'd already headed off to the pub. So I made a quick dash to the finish, realising I had saved something, and grabbed my medal, space blanket, goody bag and rather fetching Race Poncho. I should have kept the watch on, as I think it was another 2 miles before I got back to 57th Street - those 50,000 people logistics again - but the pint in the pub - and the hero's welcome from a large room full of people I did not know - made it all worth while. Preceded by Karen Grinsted (BA) 3:31:13 and my Floridian buddy, Chris Mutai 2:38:07! Ed: The picture is by Chris on the Verrazano-Narrows Bridge, and with the blue line. I like the way the runners behind are giving a wide berth to the guy with the selfie stick - perhaps they've seen footage of what often happens next. I ran the "Dirt Half" on Saturday, an off road half marathon, with about 8 miles along the canal and 5 miles on paths and tracks through the woods in the Chilterns. 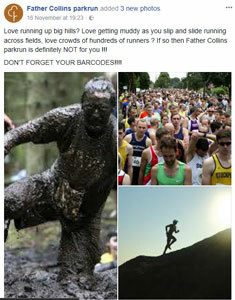 I even recognised one part as part of the Rushmere park run I ran a couple of weeks ago. SO not as much "Dirt" as I had expected for the "Dirt Half", but no complaints, the 5 miles through the woods was up and down, over tree roots and quite muddy in places, so the long flats on the canal were well received. I finished 86th out 795 finishers in a time of 1.38.07, so very happy with that as I've not done much distance running for a while. A good event if anyone fancies a well organised traffic free event late in the year. Three club members took part in last week's Street-O event from the Black Lion pub in Hammersmith. Simon Turton went out first - so early that upon his return to the pub at the finish he nearly ran into Christine Munden as she was setting off - but he had to sprint because he only had two seconds to spare! Christine did get back on time, thanks to a very speedy return from the most distant point visited. Roderick Hoffman had left a few minutes before Christine...but as on a previous occasion returned a few minutes after her and hence collected nearly three and a half minutes of time penalties. The map is confusing because it was a busy map to begin with and then had lots of red markings on it to indicate where runners were, and weren't, allowed to go. 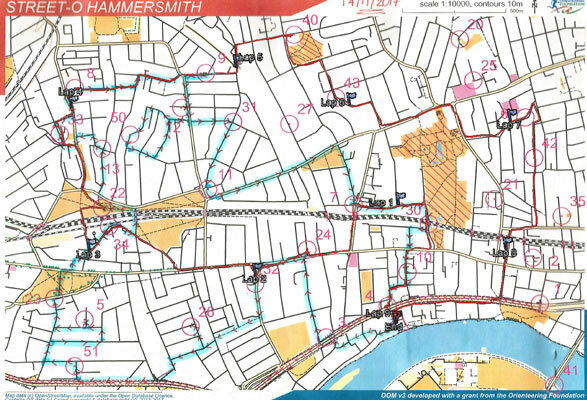 The start/finish is the red marker next to the Thames at the bottom of the map. The numbered circles indicate the controls we could visit (in any order). The light blue track with red arrows shows Simon's route. The red line with km "lap" markers shows mine. And as for the green dots...I've no idea what they are or where they came from! The next event is at Bethnal Green on the 12th December.